Pics The iPhone 5 doesn't go on sale until 8am on Friday, 21 September - yet lines of fanbois, socio-averse hipsters, campaigners and self-promoting twits awaiting the new mobe are already clogging the pavements outside Apple Stores. Yesterday on the steps of London's flagship Regent Street pomaceous-product outlet, punters queueing to seize the slightly updated phone include an unemployed bloke, a very keen Apple enthusiast and his carer and some very recalcitrant bods who insisted that El Reg bring them coffees. No such luck, Popeye. The fact that four of the first seven queuers were making films about why people queue for iPhones speaks volumes about pre-launch iPhone hype. Given the media circus surrounding those who shun more practical methods of shopping and instead queue in the British September air, it's not surprising that all of the first six were representing interest groups on the lookout for publicity. Two of the first six didn't even own any Apple gadgets: Richard Wheatcroft, 30, who was first in the queue was using a Samsung Galaxy Tab when we met him and he also possessed an HTC Wildfire. Wheatcroft had been queuing since Thursday evening last week, marking the start of an eight-night shift. 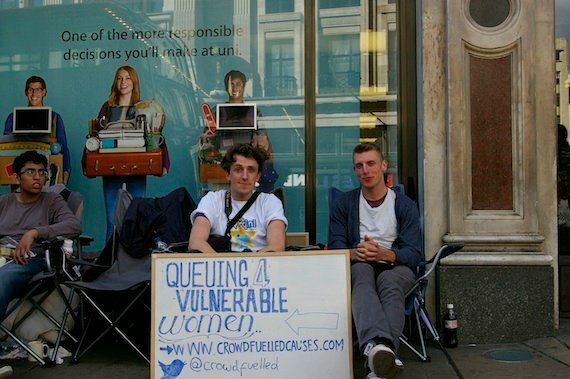 He was not queuing out of desire for the iPhone 5, but to promote a social enterprise charity that aimed to open a bakery for retraining vulnerable women. Wheatcroft, 30, said that sleeping on the street had been "humbling". His friend George Horne, 23, also worked for the charity Crowd Fuelled Causes and was filming the queue for a documentary he was making. "People don't queue like this for Samsung or Sony," he said. 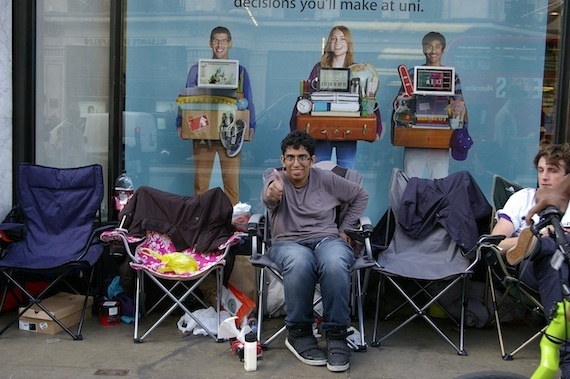 Number three and four in the line were Apple queue veteran Zohaib Ali and his carer, who were there representing an autism charity. Ali explained that iOS feature Guided Access helped autistic people use Apple gadgets. He added: "Samsung is rubbish." Zohaib Ali: "Samsung is rubbish!" 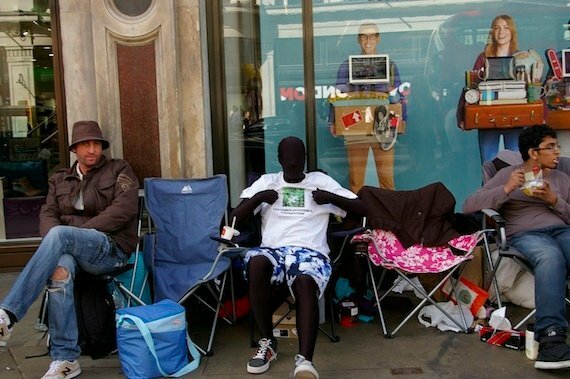 Five and six were two 18 year olds dressed in Morph suits, who were also participating in a documentary video blog about why people queue for Apple gadgets. "The Morph suit is warm," said Cam Newton, who described himself as "a Blackberry guy", but was being paid to wait on the street for it by Customer Experience Foundation - which had also provided his Morph suit. He was definitely going to keep the new iPhone once he did get it though. "I was a Blackberry guy. I'm looking forward to the iPhone 5," he said. Cam Newton: "The Morph suit is warm"